We express a warm welcome to those men who have been involved in any way with abortion. We hope the information in this section will help you to begin to make sense of your experience and assist you in your journey to healing. 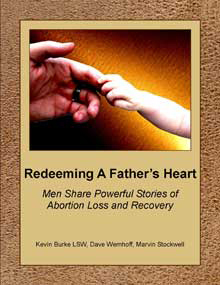 Redeeming a Father's Heart: Men Share Powerful Stories of Abortion Loss and Recovery Redeeming A Father’s Heart presents the powerful stories of 10 courageous men with the common desire to present the truth of their abortion experience and the consequences of this life changing decision. These stories are exciting and moving testimonies that journey deep into the heart of male post abortion pain…ultimately revealing the miraculous power of God’s saving power. Your Role in the Abortion-Symptoms of Male Post Abortion Grief and more. Rachel’s Vineyard Retreats-For Men Too? Can I Attend the Rachel’s Vineyard Weekend Retreat with My Spouse? Stuck in a Cycle of Repeating Self Destructive Behaviors? Perhaps sexual dysfunction was part of your suffering after abortion--here's the story of a couple featured on Dr Phil's Show. Perhaps your girlfriend or wife had an abortion against your will. You may have been powerless to stop her decision and protect your child. Fathers do not have any rights when their partner is making a decision to abort. Rachel's Vineyard will help you to grieve your loss and deal with the powerful feelings of anger and depression you are struggling with. You will need the help of others to heal of this loss. Please go to our Weekend Retreat locations for confidential email and phone contacts. You can also go to our Men's Email Buddies section. Here you will find the bios of men ready to reach out with support. Contact them with any questions and to share about your loss. Theresa Burke is the author of Forbidden Grief, and developed the Rachel's Vineyard Retreat Process. This section from Forbidden Grief on "Traumatic Re-enactment" may shed some light on some of the ways we can act out on our unresolved abortion pain, or to help us understand a loved one who is suffering from abortion trauma.